Dominant pitcher. Strikeout master. Champion. Scarer of Kruk. Randy Johnson achieved greatness in the majors. And with a highlight-filled, Hall-of-Fame career comes lots of fantastic cards. Not only that, but Johnson's career and place in the hobby also show how the hobby has evolved from the relatively simple 1980s through to the high-end hits we have now. 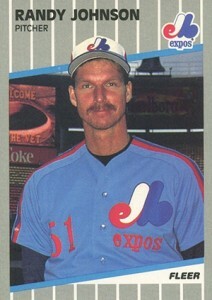 Shop for Randy Johnson cards on eBay. Randy Johnson's first cards came out in the mid- to late '80s. He has a couple of minor league cards that have grown in popularity over the years as well as several rookies. By the mid 1990s, print runs were dropping, card quality was up. His cards continued to evolve to include autographs, memorabilia and even lower serial numbers. 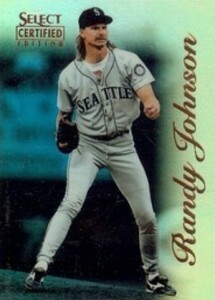 Below is a look at ten of the best Randy Johnson cards. Some might not be the most valuable, but they all play an important role in the pitcher's portfolio. We've also focused on cards that don't have tiny print runs, although some are rare and hard to find today. As far as Randy Johnson cards go, this is where it all begins. Predating his first MLB cards by three years, this is a somewhat tough minor league issue to find -- although not as tough as the look on his face. Over the years it has become a particularly popular professionally graded. 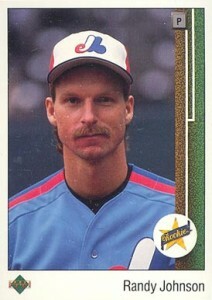 You can find several different versions of the 1989 Fleer Randy Johnson rookie card. The most notorious has an ad for Marlboro cigarettes on the billboard over Johnson's left shoulder. Ensuing print runs attempted to hide the inadvertent pitch for smokes. It's a sign of the times given the hobby's earliest roots. 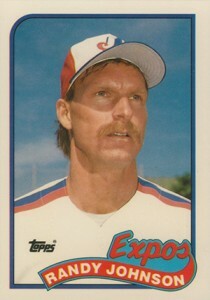 This is a premium version of the regular 1989 Topps Randy Johnson card. It's noted for a brighter back and a slick glossy feel on the front. Limited to just 25,000 copies (which is actually a very low number compared to the regular version), it was only available in a specially marked box set. It's important to remember that Johnson is also in the 1989 Topps Traded Tiffany set as a member of the Seattle Mariners. Of the two, it's the Expos card that's the more coveted. All of the cards most collectors view as official Randy Johnson rookie cards are available by the barrel it seems. And when supply is massive, prices are low. Of his rookies, it's the 1989 Upper Deck Randy Johnson that stands out. It still doesn't cost much more than a pack of gum and a newspaper, but that's more than can be said for his cards from other standard sets. 1989 Upper Deck Baseball is a landmark issue noted for its higher quality. 1993 Topps Finest Baseball was a hobby-changing release that not only offered something different appearance-wise for collectors, but it was also tough to find from the get-go. As plentiful as Refractors are today, it wasn't always that way. Their debut are still very popular today with both player collectors and set builders. This has led to sustained demand for Johnson's parallel that shines in more ways than one. 1996 Leaf Signature Series was the first MLB set to have an autograph in every pack. Johnson's autograph, which is his first signed card, was inserted in Extended Series packs. His card is a short print with an announced print run of 1,000. Extended Autographs don't have parallels like the earlier release. 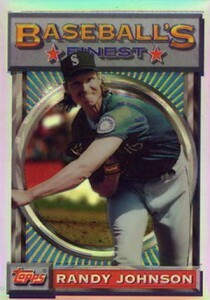 Randy Johnson has three different 1996 Select Certified Mirror parallels: Red, Blue and Gold. Although they weren't numbered, Mirror Red cards are limited to 90 copies each. Mirror Blue parallels have 45 copies each and there are only 30 of each Mirror Gold card. In today's sets, those numbers don't generate much excitement for a basic parallel. But the hobby was in a different place back then. 1996 Select Certified was a more high-end set. And even then, the easier Reds fell 1:5 boxes. Needless to say, these don't show up very often. But when they do, there is plenty of interest. 2014 Topps Dynasty Baseball debuted as the company's highest of high-end brands. Like most players in the set, Johnson has several different cards albeit with different photos. All are autographed patch cards numbered to 10 or 1. The look is different but there's no denying their quality. Randy Johnson played with lots of great players over the years. However, Ken Griffey Jr. is his most iconic teammate. Although the two appear on other autograph cards together, this is one that actually you might actually be able to find. If the card has one knock, it's that the cards use stickers for the autographs. Two of the most dominant pitchers in the 1990s together on the same card. Those signatures. Those old-school Expos jerseys. That elegant design. Simply put, this dual autograph is gorgeous. Now that the two are forever connected beyond playing for a dead franchise thanks to their Hall of Fame elections together, don't be surprised if Johnson and Pedro Martinez are on more cards together. But will any look as good as this one? 1998 Leaf Rookies & Stars True Blue Randy Johnson Parallel Card! Mariners HOF!